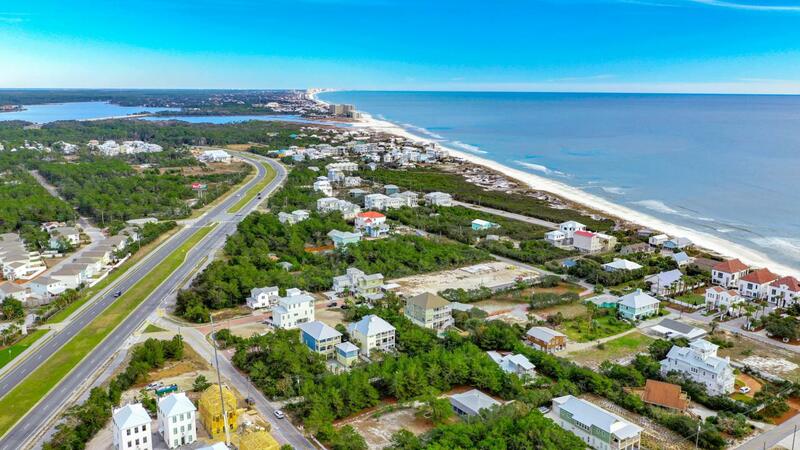 Incredible homesite in beautiful Inlet Beach on High Tide Way! Located in the charming community of The Cottages of Walton Rose, this 58' x 126' property offers the perfect opportunity to build your coastal dream home. Future proprietors will enjoy stunning views of the emerald waters of the Gulf of Mexico from the upper levels of their home. Situated less than an eighth of a mile from the beach, this property offers the ability to have your feet in the sugar white sand within minutes of leaving your home! This private secluded lot is accessed via a gorgeous brick paver street. Other homes within the neighborhood feature astonishing architecture. Side setbacks are reduced to 5' offering the ability to build a home over 7,000 sqft as well as a private pool and garage.Additionally, the property is positioned within a mile of Rosemary Beach offering outstanding access to enjoy all 30A offers including the world-class fishing, first rate dining and lavish shopping. Inlet Beach has become 30A's premier destination; the addition of 30Avenue, The Crossings and The Shops @ Inlet Beach bring a new sense of luxury to this community. There are few opportunities at this price to create your dream and build your future permeant residence, second home or investment opportunity! Buyer to verify all dimensions.